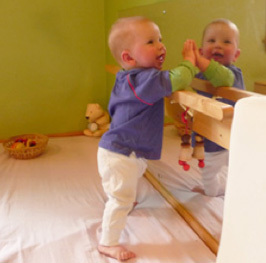 Attach a wooden bar about two inches in diameter to a wall for your child to practise pulling himself up on. Provide sturdy stools for your child to pull himself up on and remove all wobbly tables and chairs that he might pull on top of himself. Put things that your child can play with on low shelves and things that are off limit out of his reach. Put security locks on cupboards that you don't want your child to open. Help him to understand what the bar is for by showing how to clasp his hands on it. Offer a stool or a hand for you child to pull himself up on when he is showing that he wants to get up higher to see or do something. Let him try at pulling up on things for himself rather than pulling him up with your own hands. He will learn more quickly through his own effort.